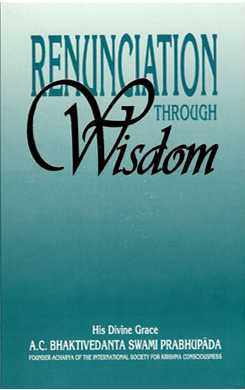 Renunciation Through Wisdom is a collection of essays Srila Prabhupada originally wrote in Bengali during the 1940s and published in India. The book was later translated by his disciples into English. How this world—with all its troubles—is insignificant from the view of eternity. Those familiar with Srila Prabhupada's other books will surely recognize in Renunciation Through Wisdom the same lively, emphatic, commonsense writing style found in his later, more well-known works such as Srimad-Bhagavatam and Bhagavad-gita As It Is. This much earlier but no less potent publication shows him already expert at distilling India's ancient Vedic wisdom into powerful, practical, and easily readable directives.